Professor, Graduate School of Economics, Rikkyo University, Japan. The Ministry of Internal Affairs and Communications (MIC), which is responsible for matters related to local government finance in Japan, states that even though decentralization reforms have been executed and are still in progress, there are three reasons that assure the financial security of local governments. First, the central government provides them with solid support for necessary resources. Second, the MIC checks and controls local governments’ bond issuance or loan borrowing based on the "Consultation System". Third, the control system of the fiscal soundness of local governments is effective. 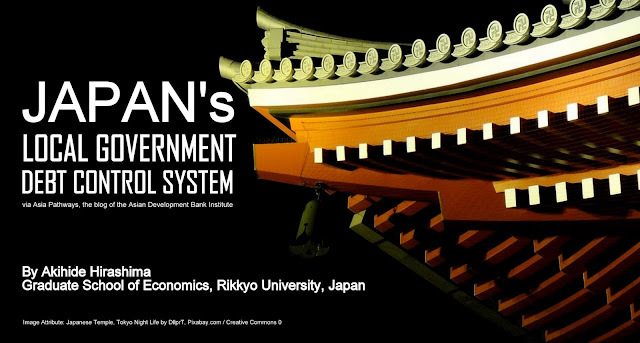 In fact, the Bank for International Settlements (BIS) risk weight for yen-based Japanese local government bonds is as low as JGBs, which is 0% in the standardized approach. The LAT is divided into two categories, namely the Ordinary LAT and the Special LAT. The Ordinary LAT, which is 94% of the total LAT is distributed to each local government based on the disparity between the Basic Financial Needs (BFN) and the Discounted Standard Revenues (DSR). The BFN is calculated to ensure a reasonable level of expenditure including some redemption of the local governments’ bonds or loans. Due to the fact that the DSR is set at only 75% of estimated Standard Tax Revenues, this will motivate the local government to collect taxes properly. The Local Autonomy Act and the Local Public Finance Act provide for the basic rules on local government bonds and/or loans. The Local Autonomy Act stipulates that bonds and/or loans must be approved by the assemblies in the budget of that fiscal year. Article 5 of the Local Public Finance Act stipulates rules similar to Musgrave’s Golden Rules on the objective to utilize local debts as resources. However, in view of the recent severe financial conditions of local governments, it has been necessary to allow them to issue bonds or borrow loans to finance the shortage of the LAT. For that purpose, a special provision has been enacted in the appendix of the Local Public Finance Act. In addition, the Consultation system has been stipulated in the Local Public Finance Act. Before FY 2006, the local governments must seek approval to issue bonds or borrow loans. With the decentralization reform based on the recommendation of the Decentralization Promotion Committee, the approval system was abolished to increase local governments’ discretion of autonomy and the "Inform and Consult System" was introduced. In the Inform and Consult System, when issuing local bonds, local governments that are financially stable must consult with the MIC or their respective delegated governors in the case of ordinary municipalities, but no consent is necessary. Even if the MIC or the governor disagrees with the issuance or borrowing, the local government may proceed by just reporting the matter to the local assembly. However, to borrow from the government funds or from the Japan Finance Organization for Municipalities (JFM), local governments must obtain the consent or approval from the MIC or the governor for the respective loans. Local governments in deficit or with a higher real deficit ratio of more than 18%, or public enterprises in the deficit should seek the approval of the MIC or the governor to issue bonds or borrow loans. In FY 2012, the Notification System was also introduced to expand the autonomy of local governments. The introduction of the new financial reconstruction scheme was a few years after the transition to the Consultation System. The Act on Assurance of Sound Financial Status of Local Governments was enacted in 2007. The act established four indices that show the financial situation of each local government’s Ordinary Account and the local government is required to disclose the indices annually after the auditors’ audit. The first index is the Real Deficit Ratio (RDR) that indicates the deficit level of local governments’ Ordinary Accounts. The second index is the Consolidated Real Deficit Ratio (CRDR) that indicates the total deficit level of a local government by calculating the sum of deficits and surpluses of all accounts including the Ordinary Account and public enterprise accounts. The third index is the Real Debt Service Ratio (RDSR) that indicates the size of the redemption amount of debts and similar expenditures. The RDSR is also used in the early warning system of the local government bond and/or loan Consultation System. The fourth index is the Future Burden Ratio (FBR) that shows the current outstanding balance of debts including that of the Ordinary Account as well as other likely future payments. The Financial Shortfall Ratio (FSR) is an index that indicates the deficit of funds of public enterprises compared to the size of the business of local public enterprises and represents the extent to which financial health has worsened. In addition, the act states that local governments must establish the Fiscal Soundness Restoring Plan, if any one of the respective ratios exceeds the Early Financial Soundness Restoring Standards (EFSRS). The act also states that local governments must establish the Fiscal Rebuilding Plan, which will strictly limit its financial activities if any one of these ratios exceeds the Fiscal Rebuilding Standards (FRS) which are far higher than the level of EFSRS. No FRS is established for the FBR. Regarding the outstanding debts of local public finance at the macro-financial level have amounted to almost ¥2 hundred trillion and almost 40% of GDP. They showed a sharp increase after the burst of the so-called bubble economy in 1991 and have stayed high but stable at almost around ¥200 trillion since FY 2003. The amount is the outstanding amount that shall be redeemed by future general revenues, mainly consisting of local taxes and the LAT. In this context, the outstanding amount includes borrowing of the Special Account for the LAT of the central government, as well as an outstanding amount of local public enterprise bonds or loans which shall be redeemed by local taxes and the LAT. Before the transition to the new Inform and Consult System, Japanese local government bonds issuance or loan borrowing faced three major challenging issues. The first issue was about the deregulation of the Approval System that came with the decentralization reforms. The second issue was the Fiscal Investment and Loan Program Reform, the Postal Privatization, and the Policy-Based Finance Reform. The third issue was the severe financial conditions of the central and local governments. Twelve years have passed since then and the overall situation of each local government’s finance is more encouraging. However, it is worrisome that we cannot forecast the resolution of the critical financial situations of both the central government and macro-financial local public finance. The most important issue for Japan is this macro-financial deficit of both the central and local governments. Akihide Hirashima is a professor of the Graduate School of Economics, Rikkyo University, Japan. This article was first published in Asia Pathways, the blog of the Asian Development Bank Institute. Asia Pathways is licensed under a Creative Commons Attribution-ShareAlike 3.0 Unported License.